Yea, I feel your pain about the pyrex! Seriously,WTF? from what you found this week I wouldn't give up! those chrissy decorations are to die for! and the wooden things are cute too! Sorry about the "no Pyrex" luck. I'll bet you're right: someone or several dealers may have backdoor deals. And you always find the best Christmas littles! You should try the estate sales, you never know what you will find there. I have found lots of things for under a dollar that are amazing. Most of the time they take pictures of the big stuff and not all the small stuff. Don't give up! I know you are hesitant about estate sales but you really should give them a try. I have found my best things at them! I've also taken to traveling outside of my immediate area to thrift and go to antique malls. I know you do that from time to time too. I know it can be frustrating, but you always seem to find such great stuff that we never see here in the states! Like others have said, you have to try an estate sale!!! The stuff you like is not normally what they take photos of. Almost every estate sale I go to has big boxes of stuff that they don't want to bother pulling out and pricing individually or taking photos of. And the people that are dying now or going into nursing homes all had kids that grew up in the 60's and 70's. Seriously, find one online that shows a bit of mid century furniture and they're sure to have Pyrex, knee huggers and fun glassware. You would have loved the one I went to on Friday! I only bought one piece of pyrex, but they had at least 20 pieces for sale (all under $5). 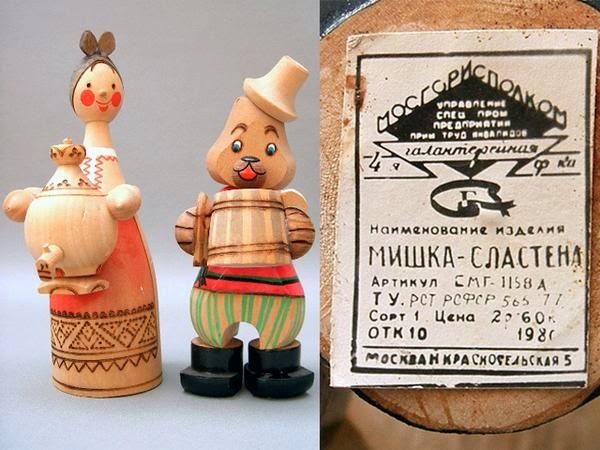 I believe your wooden figures are from Russia. They look like some I bought at a tourist shop in Moscow in the mid 1980's. Thrifted frames this week. Fixed them up a bit. March Thrifted will be added tomorrow. Pyrex ouches. I always thought that people would be cleaning out during this long winter, just for the sake of something to do, but if they were cleaning, it wasn't anything vintage - I know just how you feel, because it's the same around here. I love to hunt for this stuff, but it can be discouraging, I know!!! I haven't forgotten about your email... Life has just been crazy lately. I'm lucky to have even had time to fit in thrifting/keeping up my booth. And never give up! I keep going to the same thrifts and coming out empty-handed more often than not... but it's worth it!! I never use to go to estate sales and garage sales but the fiancé got me into it and it can be worth it I found some amazing things. Hope things pick up for you. I like estate sales because you never know what you'll find. Our local sales are 1/2 price on the 2nd day. I always hope for vintage Christmas or other holidays, but don't have much luck with that where I am. Love yours, but can't tell you anything about them. There has been a definite increase in dealers or at the very least an awareness that resellers are in the midst... which is marked by a drastic increase in thrift store prices. I guess we gotta keep on truckin' Love those owls in the trees, by the way ! No! Don't give up! It'll get better. Love all the Christmas decorations! And the Tame Hole is cool. I'm going to have to look it up.